When you try and update the BIOS in Windows using the Intel OFU program ("One Boot Flash Update") tool, you get an error message saying that there was an "Error while parsing the cfg file". This issue is caused by an out of date IPMB driver being installed in Windows. Typically an out of date IPMB driver might be in use if an older SELVIEWER, SYSINFO or Intel Active System Console has been installed or used previously. 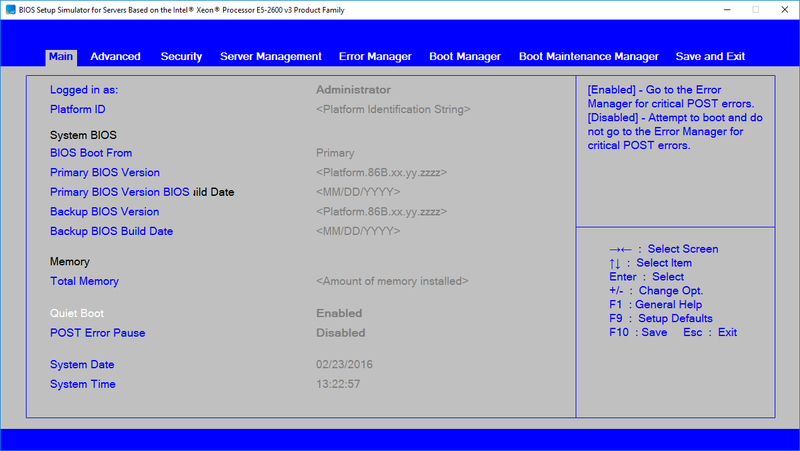 The Intel OFU BIOS Update utility can only run when an up to date IPMI/IPMB driver is installed. The OFU package contains an updated IPMI driver. Go to the x64 or x86 subfolder, depending on your version of Windows. For Windows Server, choose x64. Right hand click on the driver "install" file and use "Run as Administrator" to install it. Re-attempt the BIOS flash process. Reboot the system to complete the flashing process. Remember, that during the first reboot the system may need some time to complete the backup BIOS flash. This may add an extra 5 minutes to the POST time - do not reset or reboot the system in this time. Note: No reboot is normally required in between installing, or upgrading the IPMI driver and flashing the BIOS. Please find below a link to the Intel BIOS simulator for server systems. This is an updated similator for the Xeon Processor E5-2600 v3 Product Family, including S2600WTT, S2600CP2 and S2600CP4. 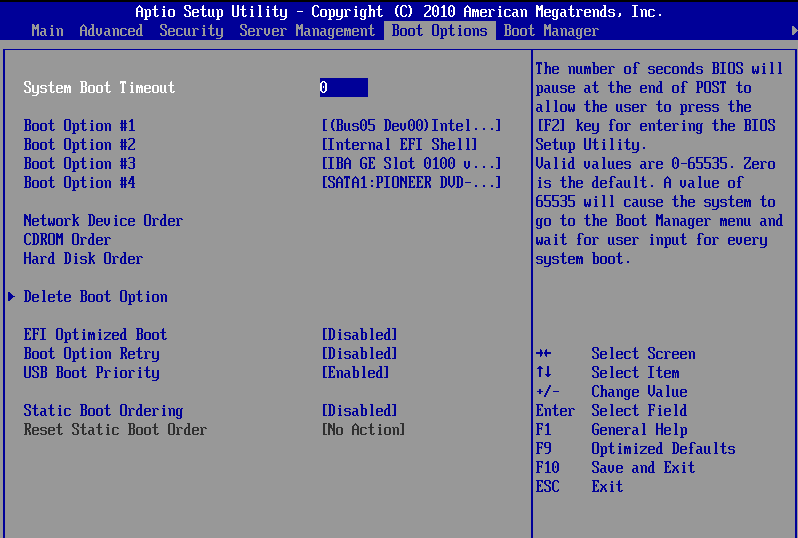 This utility simulates the BIOS interface a user would normally see when pressing <F2> during POST. It can be used for support or research purposes. Note: Use the Intel download link to obtain the latest version of this simulator. Whilst the simulator shows you the common options available on the S2600 v3 platform, there are some differences in the latest versions of the BIOS. The S2600WT example is shown below. The screenshots below are taken from the S2600WT but broadly apply to the S2600WTT, S2600CP2, S2600CP4 and S2600CW2. Stone S2600 server system families that include the Xeon E5 2600 v3 Processor. Please find below a link to the Intel BIOS simulator for S1200KP server systems. Please find below a link to the Intel BIOS simulator for server systems. The Extensible Firmware Interface (EFI) shell is effectively a small operating system built into the system motherboard on modern servers. This provides an environment for troubleshooting and maintenance outside of the operating system. 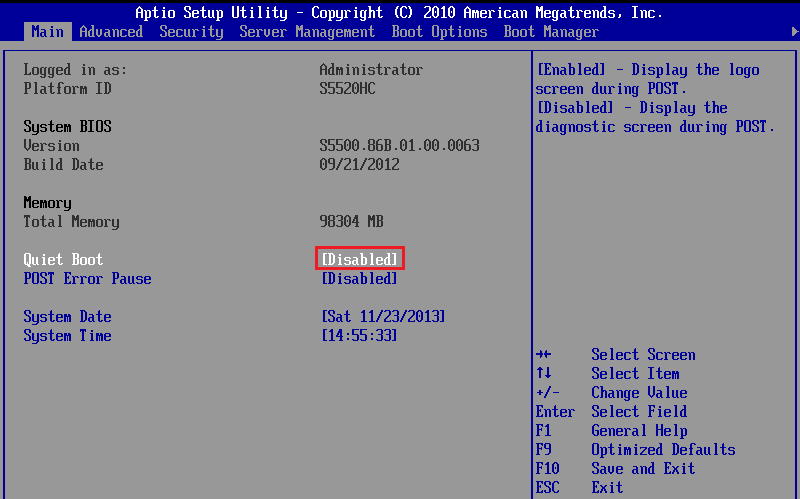 This article describes how to access the EFI shell on an Intel Server or Workstation board and how to access resources on a USB pen drive. Reminder: EFI tools can only be used when the main operating system is not running. If you are not in a postition to be able to down the server, use operating system tools instead. For example, for Windows based systems, Windows versions of the Hardware System Event Log (SEL) viewer are available, as are Intel / LSI RAID management and firmware upgrade tools. Generic instructions are provided below. Exact screens and steps may vary from model to model. Prepare your USB key - it should be formatted using FAT32 and anything you wish to use should be pre-extracted from any ZIP file. Always extract updates or tools into simply named subfolders. The use of folders prevents the system from automatically running the update (by calling startup.nsh) when you enter the shell. Insert your USB key containing your tools or utilities into the server. 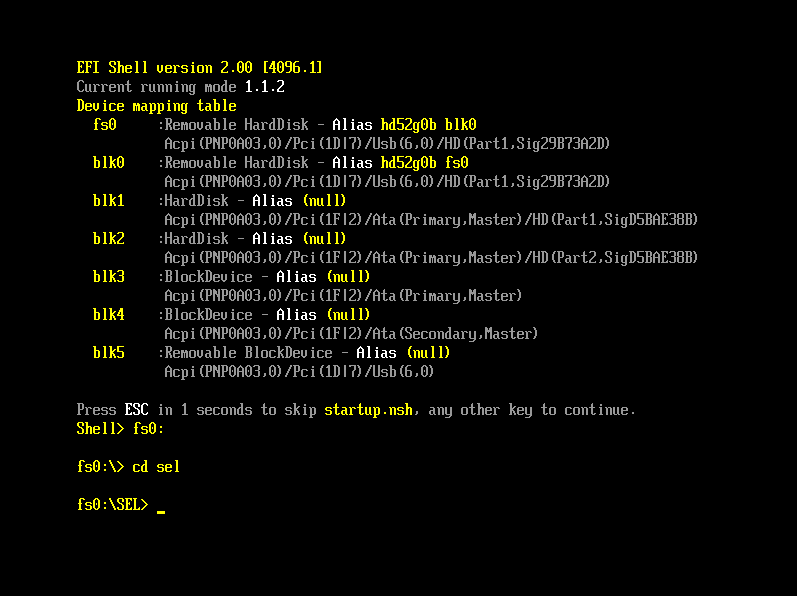 Once you have entered the EFI shell you should get a screen similar to the one below. Your USB pen drive should be detected as fs0: and should be in the list of devices. If fs0: is still not listed, your pen drive may be faulty, you may need to try an alternative USB port, or you may even need to try a different model of pen drive. 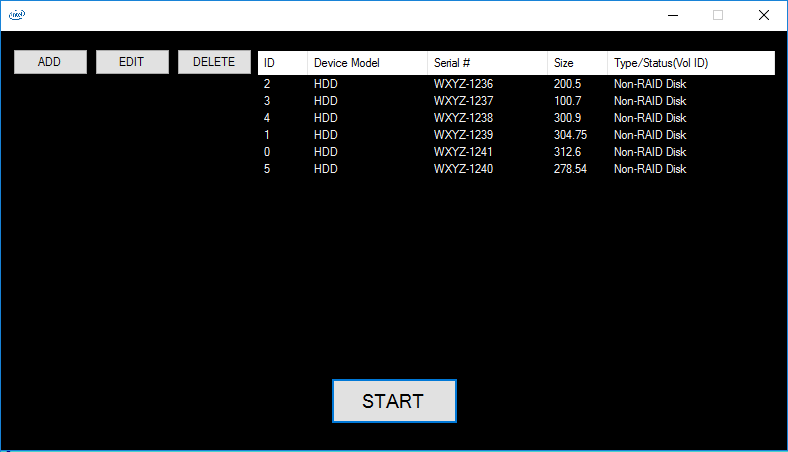 Note: Generally most FAT16 or FAT32 formatted USB pen drives will work on servers in the EFI shell, even USB3 models on USB2.0 only servers. However, add-on USB3.0 controller cards (such as those added to some workstations) may not be detected in the EFI shell. Try the front USB ports first, and then try the system onboard rear ports second. Now select the USB pen drive by typing in fs0: and pressing Enter. Some utilities also have .NSH files - these are scripts. For example, most Intel update utilities have a startup.nsh file which can be automatically executed on entering the shell. Tip: Just as in DOS, use the TAB key to help auto-complete filenames. For example, type in "CD " and then use the tab key to step through the filenames available in the current directory. Use the CD command as you would in DOS, to change directories. Its important to remember that you must put a space after the CD command. Important: Some updates, such as RAID card firmware packages, will not run inside the EFI shell on older S5000 based systems. 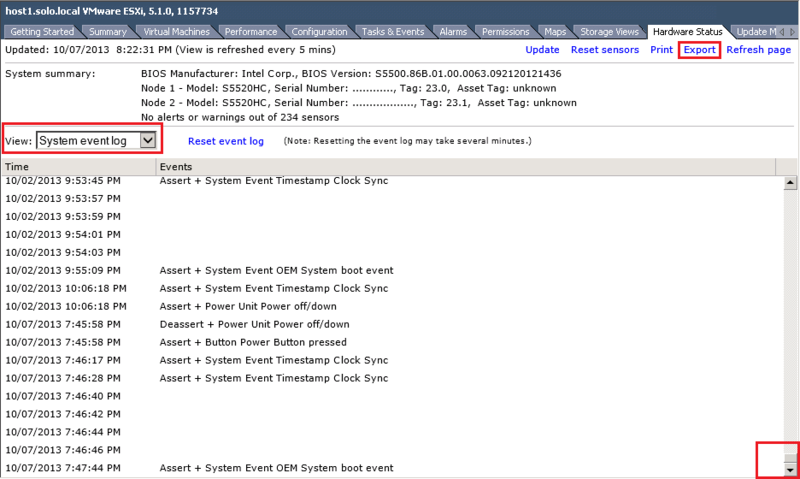 This is because these updates require EFI 2.0 which is not present on the S5000. In this instance, obtain the DOS version of the update and use a Windows 98SE DOS Bootable pen drive. A seperate article wil cover using the SELVIEW utility in both EFI and Windows environments. All Stone / Intel based server systems. Entry-level servers that use basic Serial-ATA hard drives may experience slow disk transfers if the server is a Microsoft Windows Domain Controller (DC). Typically file transfers to the server over the network are slow (around 10MB/second or less). File transfers between hard drives or partitions on the actual server itself are also slow. This issue is caused by the deliberate disabling of hard drive caching features on any system that is a domain controller. A Windows Domain Controller will attempt to disable hard drive caching features on every boot. Typically Windows cannot succeed in disabling caching features on systems equipped with a full hardware RAID controller, but it can succeed in disable caching features on systems equipped with single SATA hard drive. Note: This issue exists as Windows is operating in the way designed by Microsoft, so we cannot recommend that you work-around this issue. Hard drive caching features are disabled so as to guarantee the consistency of the Active Directory (AD) database, especially in the event of an unexpected power outage. We have provided a work-around below for customers that specifically require this, but recommend instead that customers use seperate domain controller and file/print physical servers. Use of the work-around is the customer's responsibility. This setting is visible in Device Manager of the affected system, however on every system boot the features will be disabled again. Both check boxes need to be ticked to restore maximum performance. (The default on any non-Domain Controller system is that at least the top check box is ticked). To re-enable full hard drive caching features on every boot, use the attached package. Use fixdc-diskcache.zip - for IDE or non-SCSI disks only, targeted for use with Server 2008R2. Use fixdc-diskcache2012r2.zip - for all types of disk including SCSI, targeted for use with Server 2012R2. Both fixes use the same utility but with different options. They are both usable on 2008R2 and 2012R2. However the 2012R2 version has been configured to enable caching features on all disks, including SCSI disks. This is needed on modern 2012R2 servers as most IDE or SATA disks now work through AHCI controllers which often, when the right driver has been loaded, appear as SCSI disks to the system. The 2008R2 fix only configures disks that are not recognised as SCSI to the system. Use a Scheduled task to call FIX.BAT on every system startup with a 30 second delay. Reminder: It is recommended to use seperate physical hardware for Domain Controller and File and Print services to work-around this issue, unless using a virtualised environment. This work-around is provided for customers that need to resolve this issue and is provided without warranty. Customers must always ensure that servers are protected by a UPS and that they have tested system backups which include the System State / Active Directory database. 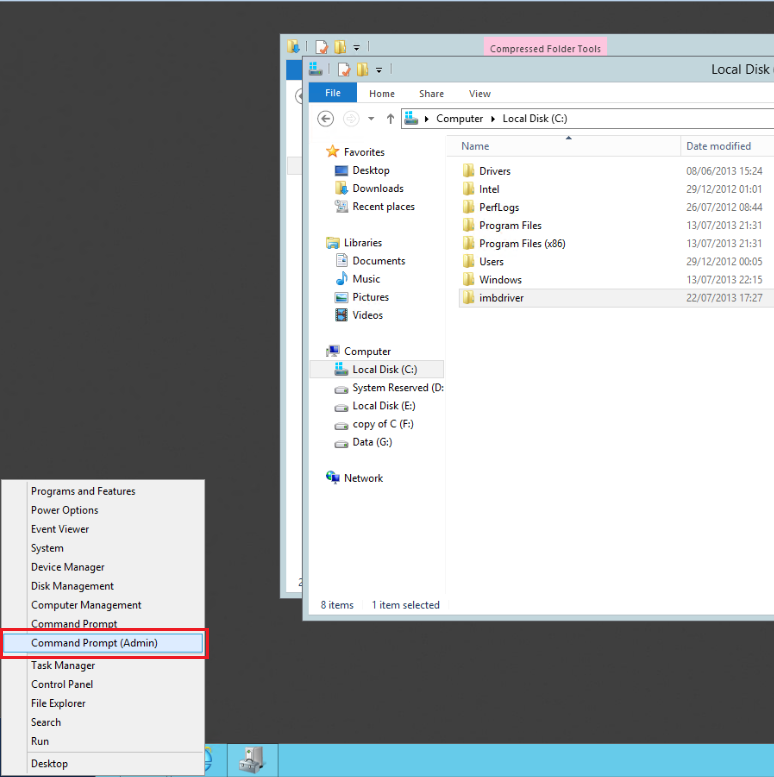 Any Windows 2008R2 or Server 2012R2 Domain Controller Server using a basic Serial ATA (SATA) hard disk. When you install Windows 7 or Windows Server 2008R2 on affected platforms the system performance can be noticeably poor. The mouse cursor is slow to respond; the system appears to be busy or have high CPU usage, and screen updates can be slow. The root cause is the Microsoft provided Intel LAN controller driver which ships with Windows 7 and Windows Server 2008R2. This driver does not properly support the controller and it will cause the above symptoms. Update the driver with the latest Intel LAN driver available from the Stone driver finder or Intel website. Updating the driver will restore the lost performance and also add the additional features provided by the full Intel LAN driver package. The LAN driver for these systems should be date 2011 or newer, as opposed to the Microsoft 2009 in box driver. Additional: On rare occasions we have seen system hangs during Windows setup, again because of this issue. If you encounter a system hang whilst installing Windows, disconnect the system from the network and then use a patch cable to connect both LAN adapters together. Then, attempt to install Windows again. When installed, then update the LAN driver as above. The Intel S5000 based servers and workstations do not have an EFI based SELVIEWER tool. If Windows is not running, you need to use the DOS based tool in order to gather the hardware System Event Log (SEL). 1. Download the correct tool - here or here - for your S5000PSL, S5000PAL, or S5000XVN system. 2. Format a USB pen with the FAT32 file system. Make it bootable. To do this you will need a copy of the Windows 98SE boot files and a copy of the USB Format tool here or here (3rd party site). 3. Extract the DOS Selviewer download to the pen drive. 4. Boot the server from the pen drive. If necessary, go into the BIOS using the F2 key, and use the Boot Manager screen to directly boot from the pen drive. 5. When you have the DOS prompt, either run SELVIEW to lauch the GUI (which will allow you to save entries) or type in SELVIEW sn.sel /save to save a copy of the log entries directly to a file. 6. Send a copy of the file to Stone support for analysis. Note: Use a different filename from SN.SEL, such as the machines actual serial number, if you are dealing with multiple servers. You can examine SEL files by using Wordpad or Notepad to open them. The Windows based Selviewer does not normally require rebooting to get the hardware log files, making it a useful tool. The instructions below are a guide as there are different versions of the Windows Selview tool and some of them look slightly different, or the filenames may vary. 1. Download the Windows Based SELVIEWER Tool for your platform and extract it. 2. Go into the extracted Selview folder, and then into the x64 or x86 subfolder, depending on your operating system. 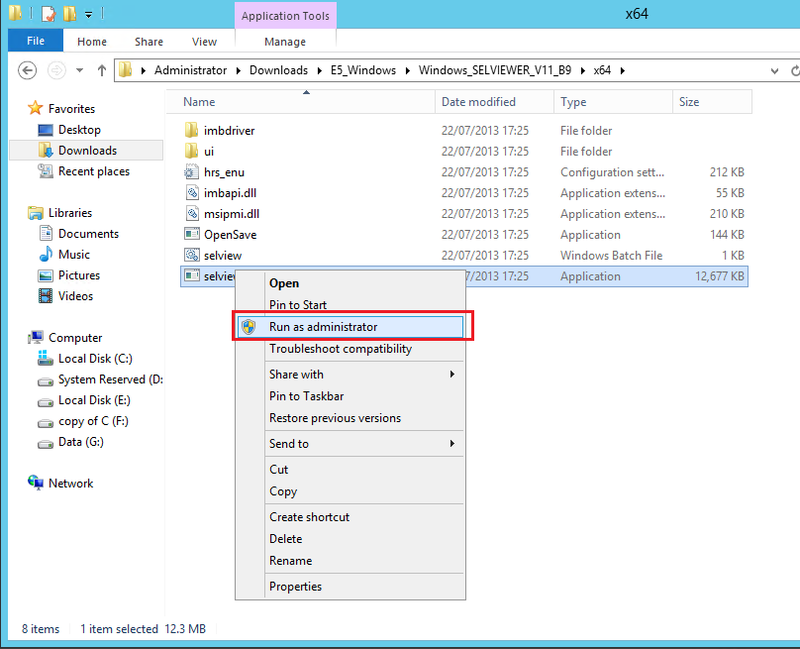 Copy the contents of this x86 or x64 folder to C:\SELVIEW or another easy to type location. 5. Some version of Selviewer require Java if you plan to use the full interface. As these instructions cover quick usage without the user interface, Java is not required to be installed. 6. Using the Administrative command prompt, go to the folder containing Selview.EXE (use the corresponding sub-folder x86 or x64 depending on if your operating system is 32-bit or 64-bit). 7. Run SELVIEW.EXE sn.sel /save to save a copy of the events. 8. Send the output file to Stone support for review or alternatively use Wordpad or Notepad to examine them. Tip: If dealing with multiple servers, call the output file a different name - its recommended you use the server serial number. 5. Install Java if your version of Selviewer requires it (you can also always tell this by seeing some .JAR files in the UI directory). 6. Run the SELVIEW.EXE file, or the batch file (using the version which matches the edition of Java you installed (32bit or 64bit), if your Selviewer needs Java. For example run the x86\SELVIEW.EXE program if you have 32-bit Java installed or the x64\SELVIEW.EXE program if you have 64-bt Java installed.). You will need to run these as an Administrator. 7. Use the File > Save As option within the program to save a copy of the events, which you can then send to Stone for Analysis. You can also use Wordpad or Notepad to open them. Note: If the Selviewer program crashes when you run it, follow the instructions in the troubleshooting secion. 1. Download the Windows Based SELVIEWER Tool for your platform. This package normally comes with several utilities bundled inside, including the Selviewer tool. 2. Extract the downloaded file into a subfolder. Sample below. 3. If you are running a 64-bit system (most likely) go into the x64 subdirectory. If you are running a 32-bit system, go into the x86 subdirectory. This is important as the edition of the IPMI driver must match your operating system (32-bit or 64-bit). The quickest way to do this on Server 2012 is to move the mouse cursor to the far bottom left of the screen, and then the Start image comes up, right hand click on it. Then choose Command Prompt (Admin). 9.This should then report that the installation was successful. Note that in most instances a reboot is not actually required. 10. Go back to the files you extracted earlier. 11. If your version of Selview requires Java, this will need to be installed first. 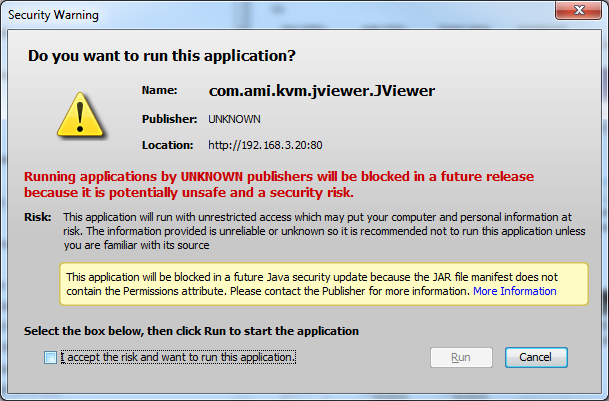 You can double check if Java is required by checking for the presence of .JAR files in the UI subfolder. 12. If required, Install Java. If not required, skip to step 13. You will get either 32-bit or 64-bit Java depending on whether or not you are using a 32-bit or 64-bit browser to browse the internet. (64-bit browsers will require a 64-bit operating system). It is important to note or realise which version of Java is being installed as you will need to use the matching Selviewer program. (While the IPMI driver needs to match your operating system, the Selviewer program needs to match the Java edition you have installed). 13. Now run the Selviewer application. If your Selviewer doesnt require Java, then choose the version from the x86 or x64 folder which matches your operating system. Right hand click on the Application and choose Run as Administrator. 15. When the Selviewer interface has loaded, use the File and then Save As option to save the events to a file. 16. 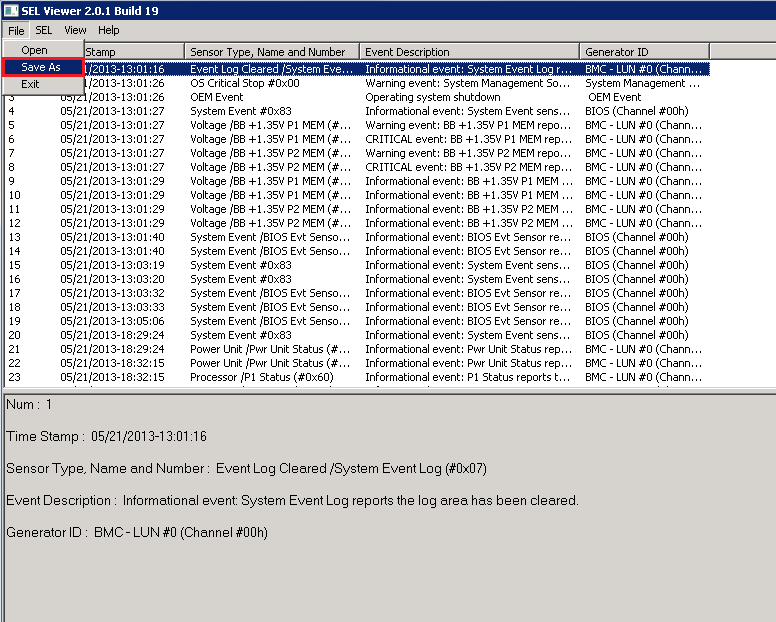 Send the event log file to Stone for analysis. You can also use Wordpad or Notepad to examine the file. If the Selviewer program crashes when you run it, follow the instructions in the troubleshooting secion. Reminder: If you install the Windows 64-bit version on a 64-bit capable system but the SEL viewer fails to run, it may be because you either dont have any Java installed, or you only have 32-bit Java installed. It is possible to install the 64-bit IPMI driver and then use the 32-bit SELVIEWER utility with 32-bit Java installed. If the Selviewer program crashes or stops responding when you run it, the problem is likely to be around the IPMI driver. Check Device Manager for the presence of a Microsoft IPMI driver or an older Intel IPMI driver. If it exists, you will need to use Device Manager to manually upgrade the driver to the Intel version contained in the SELVIEWER package. Re-running the "install" program for the IPMI driver will not solve the problem as this may not over-write an existing Microsoft IPMI driver. Most modern servers retain hardware events, including informational, warning, and error events, in a dedicated hardware event logging system held on the motherboard. These logs can be useful in troubleshooting problems, such as a flashing hardware health symbol. 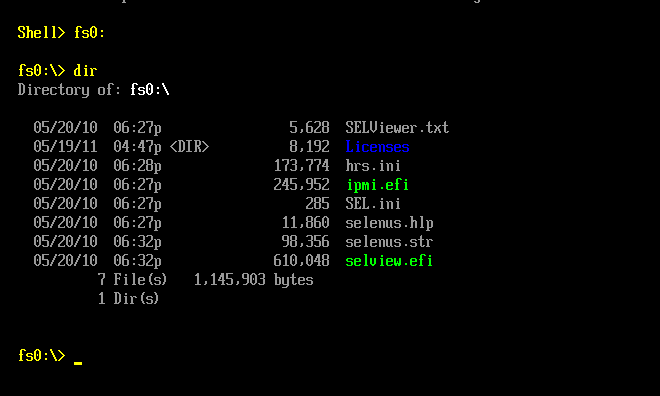 The EFI shell (which can only be used when the host operating system is not running) and the EFI Selviewer tool. Using the Windows Selviewer tool when Windows is running directly on the system. 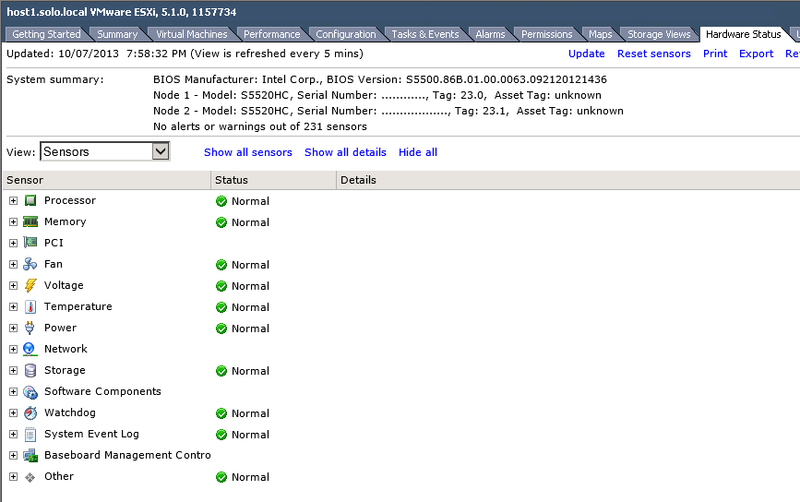 It is also possible to retrieve a basic hardware event log directly using the VSphere client for servers running the VMWare ESXi Hypervisor. The method to achieve this is below. Log into your VMWare client and connect to your VCenter server, or directly to your host server. Examine the hardware sensors and ensure that all sensors are showing as "Normal". Then, using the "View" dropdown, select "Alerts and Warnings". Ensure that the system reports that there are "No alerts or warnings". Finally, using the "View" dropdown, select "System event log". Use the Export option on the top right hand side to save a copy of the events. This file can then be sent to Stone Support for review. Note: Events saved using this method may not be as detailed as obtaining the full SEL using the EFI tool, but it does allow the gathering of diagnostic data without interruption of service. If you are troubleshooting an issue and the guests have already been migrated to other hosts, we recommend you use the opportunity to gather a full hardware SEL log from the EFI (depending upon the model of server). Server systems that support SEL / IPMI storage and retrieval. On some combinations of hardware RAID card and server or workstation motherboard, when you attempt to go into the RAID Card BIOS Console the system ignores the request and boots normally. 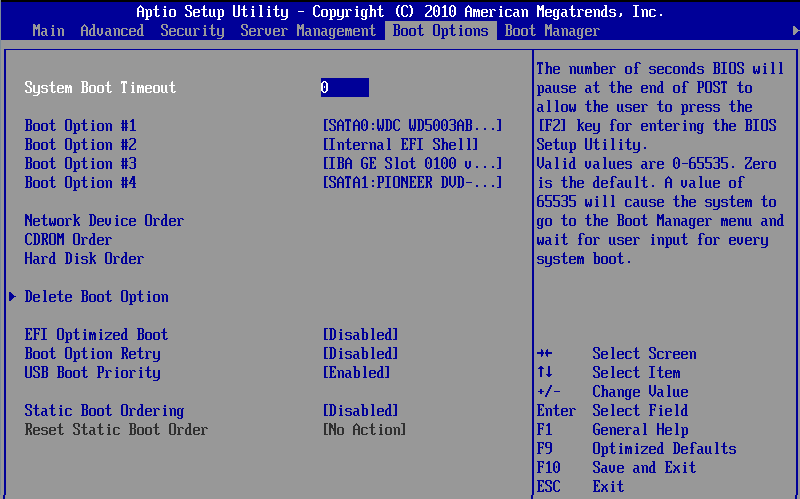 For example, you press CTRL+G during the RAID initialisation screen when an RMS25CB080 is fitted, but unexpectedly the RAID Card BIOS Console does not start when POST completes. This is normally caused by a compatibility issues between the RAID card or module and the motherboard. Both a resolution and workaround are available for this issue. For the workaround, scroll down. To resolve the problem, ensure that both the motherboard BIOS and RAID BIOS are up to date. Usually this can be done on most modern motherboards using the EFI environment, meaning that you don't need to access the RAID BIOS Console to actually perform the update. Two work arounds are available - Work Around 1 uses the Boot Menu (F6) and Work Around 2 uses the BIOS Setup (F2). Use CTRL+G as normally (or the correct combination for your RAID card) to request the RAID Card BIOS Console as normal. In addition, enter the motherboard boot menu. This can usually be done before and/or after the RAID Card initialisation screen has been displayed. 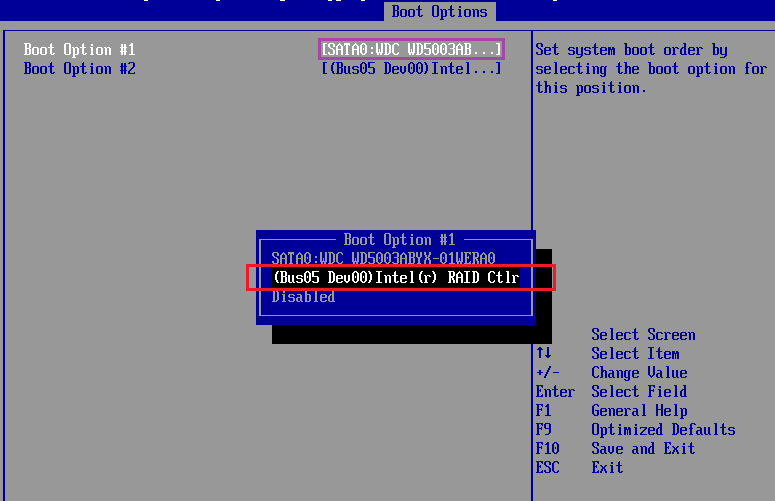 On most Intel server boards, the boot menu key is F6. Once the motherboard boot menu appears, choose PCI ROM Setup. 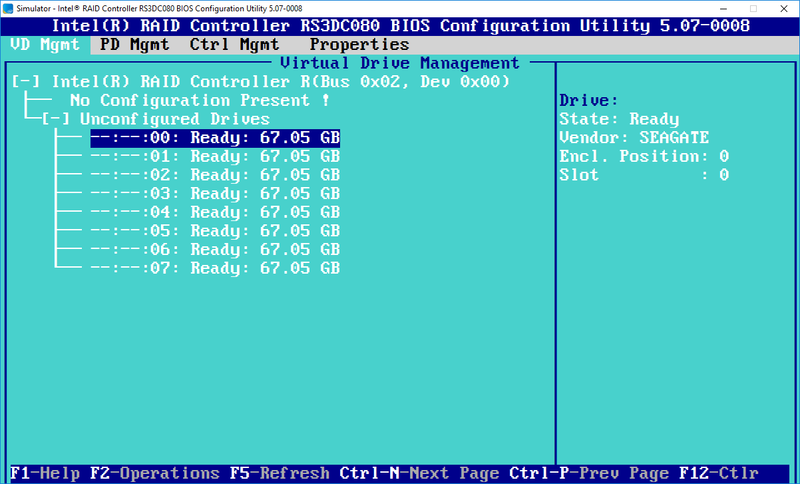 ​The RAID BIOS Console is then displayed. In addition, enter the motherboard BIOS setup. This can usually be done before and/or after the RAID Card initialisation screen has been displayed. On most Intel server boards, the BIOS setup key is F2. Once the motherboard BIOS appears, go to the Boot Manager Screen. All Intel Server and Workstation systems with Hardware RAID cards or modules fitted. If the system is still booting - ensure that the RAID drivers for the new card are installed, and/or a sufficient version to support the new card. For example, customers replacing an SRCSASRB or SRCSATAWB should be running driver version 4.x before trying to upgrade to the Intel RS2BL080. Flash the latest approved firmware on the new card. Note: RAID Card firmware updates in the above process will almost certainly need to be done in the EFI environment. If you perform any updates using RAID Web Console from within Windows, do NOT use the option to enable the RAID firmware update to take immediate effect. The firmware update may be flashed whilst Windows is running, but the system should then be rebooted for it for take effect. Confirm the fault with the original motherboard, saving a copy of the hardware SEL LOG for reference. Replace the motherboard and refit all cards and components in the original slots. Ensure any RAID keys are transferred. Customers using the AXXRMM4 (RMM4) or AXXRMM3 (RMM3) remote management modules may experience a security message when they try and use the remote keyboard/video/mouse (KVM) feature. 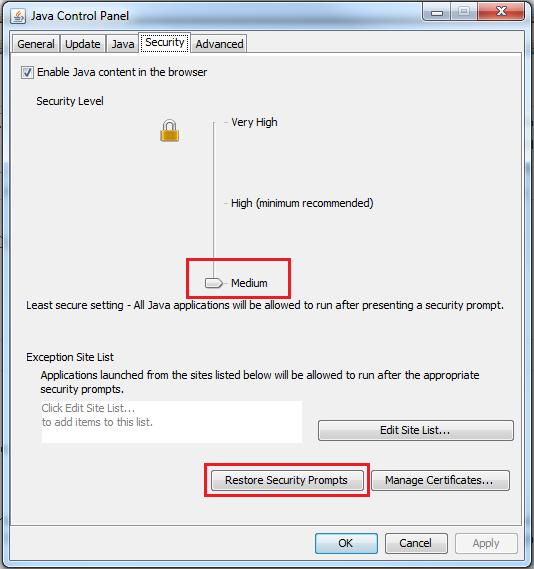 The security message may either completely block the page or warn that the application may be blocked in future, depending on the version of Java installed or the Java security settings in force. 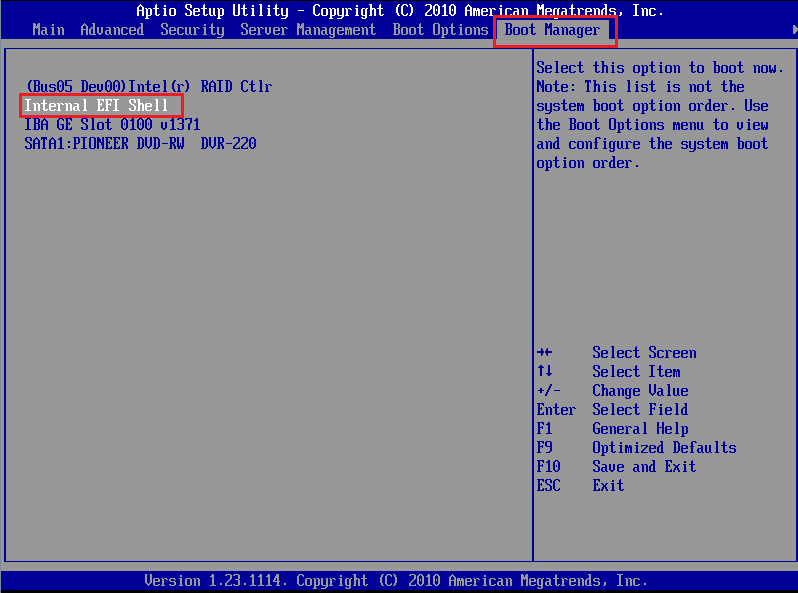 This issue is caused by the Baseboard Management Controller (BMC) on the motherboard having KVM applet code which does not include the proper publisher identifier information. Close the security prompt and browser Window. Open "Configure Java" in Windows. Re-try launching the KVM from the browser. If this does not help, try "Restore Security Prompts" and re-open the KVM again. In the Java Control Panel (as above), add the IP address of the RMM module to the Exception Site List by clicking on the Edit Site List button. If the workarounds are not sufficient, upgrade the system firmware package with the May 2014 version or newer. This includes update BMC and RMM code to correct the publisher attribute. If the workarounds are not sufficient, contact Stone Support for beta BMC 62 code which resolves this issue. The Intel X710 Series 10Gbe Dual or Quad port network adapters may report that one or more ports cannot start. The problem may appear if the driver was recently upgraded either through Windows Update, or by downloading the updated driver from the Intel web site. RAID systems can add resilience against disk failures and/or combine the performance of many disks into a fast single volume. It is important that any faults or error messages with RAID systems are promptly examined to ensure that data is protected. The LSI MegaRAID storage console (MSM) for LSI Hardware RAID Adapters. The Intel Raid Web Console 2 (RWC2) for Intel Hardware RAID Adapters or modules. The Intel Matrix Storage Console for SATA/AHCI controller based software RAID systems. Hardware RAID is recommended for most server applications and this article deals with the management of an Intel Hardware RAID system. Always ensure that the proper RAID driver is installed and running. Do not rely on Microsoft provided RAID drivers. Driver version 6.x is recommended for Intel or LSI Hardware RAID Adapters. For Intel adapters SRCSASRB, SRCSATAWB or RS2BL080, RWC2 version 12 or later should be installed. For second generation 6G adapters such as RMS25CB080, RWC2 version 14 or later should be installed. For first generation 12G adapters such as RS3DC080, RWC2 version 15 or later should be installed. Download MSM from the LSI/Avago web site and Intel RWC2 from the Intel site. If your system is old and being re-purposed or taken offline for maintenance, consider upgrading the firmware on your RAID controller. Ensure that the drivers are up to date and that you have a full, tested, disaster recovery backup first. If a harddrive fails, replace the hard drive. Do not attempt to re-use a failed hard drive. Remember: The protection that a RAID array gives against failure is NOT a replacement for having adequate backups. Always have proven tested backups for your operating system, system state, and most importantly, your data. When planning and implementing your storage system, consider the performance, capacity and resilience that your system requires. 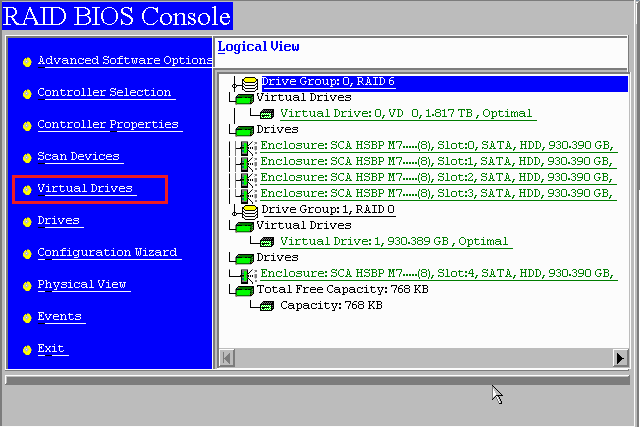 For example, a VMWare virtual server in a SAN environment may be able to run the operating system using RAID1, as the operating system disks have little load most of the time (unless the system has more virtual RAM committed to guest operating systems than physical RAM available, in which case VMWare may page to disk and this will put a load on the local storage). Another example is a file server with a large RAID array. In this situation, consider using RAID6 and possibly include a hot-spare as well. Especially when the server is not in a location where you can hear audible failure messages, it is important to set up email alerting. Even if the server is is in a place where you would normally hear an alarm, the use of email alerts can help you be aware of problems when you are away from site. Use the Alert tab to confirm which type of event gets notified using the right delivery methods. For example, you do not want Information events delivered by email. Then use the Mail Server tab to configure the SMTP server settings. Example below. Finally, use the Email tab to list the recipients that should receive the email notifications. Please review our other RAID articles as these cover topics such as troubleshooting, the RAID levels available, and the differences between desktop and enterprise class hard drives. If your RAID system is beeping this almost always indicates a hardware fault. Faults need to be investigated and corrected promptly. The easiest way to do this is to always set up your servers or systems with the correct monitoring software when you install the system. This means that you do not need to find additional utilities or software when your system is in a potentially dangerous state. Always contact Stone Support for warranty service and advice. We can help you when your system has a problem and help protect your data. The steps below are provided as a guide and are not exhaustive. They are based on a system with an Intel or LSI hardware RAID controller or module. Use the RAID monitoring software to check the health of your Logical or Virtual Drives (Virtual drives are the actual RAID arrays themselves, as opposed to each single physical drive). Partially Degraded RAID6 arrays have had a single drive failure. Degraded RAID5 arrays have also had a single drive failure. Degraded RAID6 arrays have had two drive failures. A RAID array marked as Failed has had more drive failures than it can tolerate. Check your servers Hot-Swap drive bays (if fitted) and look for any drive bays with an amber or flashing amber/orange LED. Amber usually means that the drive has failed; Amber/Orange usually means that the drive in that bay is being rebuilt. An Amber/Orange drive may not be the faulty drive in the system if that drive was previously unused and marked as a "Hot-Spare". Problems detected in a patrol read, such as bad blocked which indicated that a drive is about to fail - again check the RAID log for details but also check each physical disks Media Error Count and Predictive Failure Count. If the RAID system appears to be completely healthy, double check that the beeping noise is actually a RAID event. For example, some server systems may beep when a Power Fault is detected. Or, a UPS in the cabinet may have a problem. Check your servers warning triangle and ensure that it is green. Try silencing the RAID alarm. If the beeping persists, you have not got a RAID system fault. Remember: An Amber/Orange drive bay light may not necessarily indicate that that drive is faulty - it could be that the drive in that bay was previously available as a Hot-Spare and the system is rebuilding onto it. Check for the presence of other amber lights or other "Unconfigured Bad" drives in the RAID console. Right hand click on the controller. Important: Do not use the feature to Disable the Alarm, as this will prevent you from hearing the audible alarm if there are future failures, or for example the rebuild process fails to complete. Identify hard drives first before replacing them. Use the Drive location feature if you have hot-swap drive bays fitted. If your system doesn't include hot-swap drive bays, then record the Port or Slot number of the failed drive, as well as the serial numbers of either the failed drive, or, if this is not accessible, record the serial numbers of the remaining drives for elimination purposes. You can then work out which is the failed drive. Always hot-swap drives where possible. Do not shut the system down unless necessary - hot-swapping allows the rebuild process to start automatically if configured. Always replace drives with equal or greater capacity and equal or greater performance. It is recommended that you don't use Advance Format drives if the RAID array was built on non-Advance format drives. Always ensure that the rebuild process starts and then completes. If the rebuild process doesn't start automatically (this is the default on older controllers such as the Intel SRCSASRB and Intel SRCSATAWB) mark the replacement drive as a global hot-spare. This will trigger the rebuild process. Add-in cards may not function reliably; for example network connections on add-in network cards may drop randomly or perform poorly. The system may be unstable. This can be caused on S1400 / S1600 / S2400 / S2600 Intel server or workstation boards by the use of an un-validated or unsupported PCI Express Gen.3 (generation 3) add-in card that has been fitted to a system that has a PCI Express Gen. 3 capable processor. Intel originally released most of the above server platforms for PCI Express Generation 2 operation, namely for the first 32nm Xeon 2400 or 2600 series chips. The new 22nm V2 versions of these chips support PCI Express Generation 3, which increases the data transfer rate. However, the system boards only support these increase data transfer rate on certain Intel validated add-in cards. The list of validated cards varies according to the Intel motherboard in use. 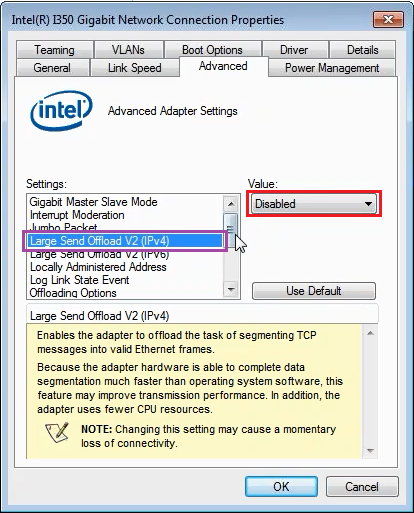 Add-in cards which are not validated to run at PCI Express Gen. 3 on the affected server boards should have the appropriate PCI Express Slot configured for PCI Express Gen.2 operation only, by using the Processor PCIe Link Speed settings in the PCI Configuration menu. Stone S1400 / S1600 / S2400 / S2600 server system families. Please find below a link to the Intel RAID Simulator for 12G (12-Gbit) adapters on server systems. These controllers are available as either a plug in PCI Express Module, a PCI Express Card, or Integrated onto the motherboard. These controllers should not be confused with onboard software RAID or SCU controllers. This utility simulates the RAID BIOS interface a user would normally see when pressing <CTRL><R> during POST. It can be used for support or research purposes. Please find below a link to the Intel ESRT-2 RAID BIOS simulator for server systems. This controller is integrated into a number of onboard SATA or SAS controllers to provide basic RAID functionality. Most implementations of this controller provide basic hardware or firmware assisted RAID. ESRT-2 RAID should not be confused with RST-e RAID. Intel Rapid Storage Technology - Enterprise - is a software based RAID solution with some additional logic and firmware build into the motherboard PCH chipset and BIOS in most cases. This utility simulates the RAID BIOS interface a user would normally see when pressing <CTRL><G> or <CTRL><E> (as dependant on model and BIOS message) during POST. It can be used for support or research purposes. Please find below a link to the Intel RSTe RAID BIOS simulator for server systems. Intel Rapid Storage Technology - Enterprise - is a software based RAID solution with some additional logic and firmware build into the motherboard PCH chipset and BIOS in most cases. This utility simulates the RAID BIOS interface a user would normally see when pressing <CTRL><I> during POST. It can be used for support or research purposes. This article will show you how to recover a failed RAID 5 array on an Intel or LSI hardware RAID controller. The same or similar process can also be used with other RAID arrays such as RAID 1 or RAID 6. It is important to understand first how drive configuration information is stored, and what a "foreign configuration" is, as you may see messages about this appear. What is a Foreign Configuration? Intel or LSI Hardware RAID controllers store RAID volume configuration information on both the drives and the controller. When the system is booted or a drive is inserted, the drives and configurations are examined and any configurations that don't match each other are flagged as a foreign configuration. The RAID controller will use its own configuration as the master record, to identify which configurations are invalid. All physical drives configuration information contains a list of the drives involved in the associated logical drive. What's the difference between Optimal, Degraded, Critical and Offline? RAID controllers use these terms to show the health of the logical drive. Degraded: A failure has occurred; likely a drive is missing. However, the RAID array may be able to tolerate further failures. The bad drive should still be replaced as soon as possible. Critical: A failure has occurred and the RAID array health is critical. Any further failures will lead to the loss of data. Offline: The virtual drive has failed and the data will be inaccessible. Recovery can be attempted but is not guaranteed. For example, RAID6 arrays can lose up to two drives. The loss of one drive will result in the logical drive being reported as degraded, not critical. Scenario 1 - The system is booted but not all of the drives are plugged in, possibly due to a loose cable. Switch off the server and check all the cables and connections, especially the seating of any multi-lan SFF-8087 cables. Reseat all drives and re-test. Do not accept the message above or load the configuration utility: Doing so will write a configuration message to the remaining drives detailing the drives which are missing. Hard drives which encounter problems such as bad blocks or a controller fault may stop being able to be detected. The drive may then become "available" again, perhaps after the drive has reallocated the bad blocks. However, when the drive failed, the RAID card will have written a configuration update to itself and the remaining drives, notifying the failed drive. The configuration on the failed drive is now out of date and does not match the other drives, so it is flagged as having a foreign configuration. If the RAID array is degraded or critical, it is usually safer to attempt to rebuild onto a fresh drive, rather than trying to either re-use a problem drive (i.e. rebuilding onto it), or worse, trying to force the previously failed drive online. This is because any disk writes that have occurred to the RAID pack - even just the normal day to day running of an idle Windows system - will mean that the drive that failed and has now re-appeared contains out of date data. Attempting to put this drive into use without rebuilding will result in serious system corruption. If the RAID array is marked as failed, always try and import the foreign configuration, making sure that the drive that failed last is the drive that you try and re-use. Drives that failed earlier (as perhaps you could have in a RAID 5 or RAID 6 situation) will not only have an out of date or foreign configuration, but more importantly the data on the drive will likely be out of date if an operating system has been booted or running since the failure. ​Scenario 3 covers importing a foreign configuration. ​Scenario 3 - The drive was disconnected accidentally, my array is offline and I need to recover it. Disconnected drives will either be marked as Foreign, or Unconfigured Bad. Unconfigured bad drives cannot be have the foreign configuration imported until you mark the drive as "Unconfigured good". Foreign drives detected on the RAID card boot may be flagged as below. In this instance, either Press F, or better still, press CTRL+G to enter the RAID BIOS and manage the foreign configuration process. Some older RAID cards may allow you to Import a foreign configuration without Previewing it. However we recommend you always preview the configuration to be imported and check that all logical drives - including those that have no problem - are correctly shown. If you have different drives with different foreign configurations then you may have multiple choices to try and import. Try "All Configurations" first. If this does not work, try each configuration in turn, making sure you preview it first. It is likely that only the configuration from the last drive that failed will be importable. Tip: If you can still boot your operating system such as Windows - for example, you are managing a problem with your data logical drive, but your operating system logical drive is still functioning, you may find it easier to boot Windows and use the Intel RAID Web Console to manage the array recovery. Right hand click on the RAID controller from inside RAID Web Console and select "Scan Foreign Configuration" to start the import process. Scenario 4 - I'm Running RAID 5 and my system crashed. I appear to have had two hard drives fail. This can happen especially if you have a hot-spare drive. When the first drive fails, the RAID card will start rebuilding onto the spare. The unusual workload may cause another weak drive to then experience a failure. Tip: Using RAID 6 instead of a RAID 5 plus hot-spare configuration prevents you from being in this situation. RAID 6 will still require a logical drive rebuild but RAID 6 can withstand up to two drive failures without going offline. Enter the RAID BIOS console, and check for the presence of any drives marked as unconfigured bad. Click on the drive, and then choose the option to "Mark as Unconfigured Good", then click on Go. The RAID card likely will NOT prompt to import the foreign configuration at this time. You will need to reboot and then go back into the RAID BIOS to follow the foreign configuration import process. Note: In some situations when you have multiple drive problems you will not be able to go into the RAID BIOS when there is a foreign configuration present, even if it will not import. Do not clear the foreign configuration, as you should always attempt the least destructive operations first. In this situation, determine which are the problem drives by the orange LEDs on the front of the server. Turn off the server, and then remove one drive. Boot the server backup and attempt the import process, or mark the drive as Unconfigured good and then reboot, and attempt the import process again. Only the last drive to have failed will likely import, but it does mean that this last drive needs to be healthy enough to get the RAID array back to a degraded or non-critical state. Always ensure that the RAID array is rebuilt when necessary. You can check the progress from the RAID BIOS or from the Intel RAID Web Console in Windows. Never disable the audible alarm. Always silence the alarm, even if you need to do so multiple times. Always contact Stone support if a drive is marked as failed, or having bad blocks/media errors. Drives in this situation should be replaced. When dealing with RAID problems, check the Media Error count or Predictive failure count to see if you are managing multiple problems. What Can I do to Minimise the Chances of Unexpected Failures? Always have the correct version of RAID Web Console installed if you are running Windows, or use a Remote RAID Console plus the Management component if running VMWare ESXi. Set up RAID Web Console for email alerting of problems. This may alert you to minor problems or growing issues before a drive fails completely, for example. Take advantage of the option for a scheduled consistency check available in RAID Web Console for Window. Right hand click on the controller and then select "Schedule Consistency Check". To ensure your system can manage drive problems more reliable, always use a recent RAID driver, RAID firmware and RAID Web Console software when commissioning your system. Contact Stone support for further assistance. 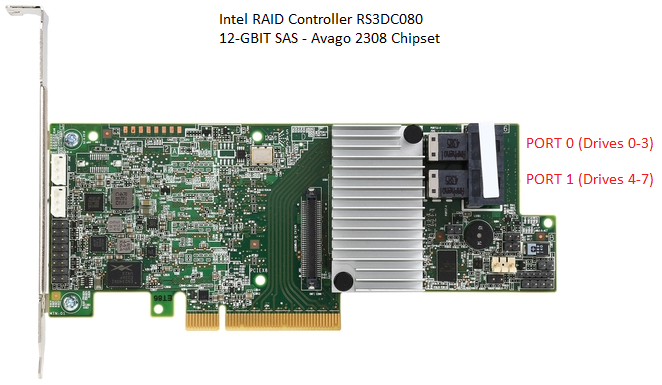 Server and Workstation products with LSI or Intel Hardware RAID Controllers up to and including the 2.5Generation 6G SAS Adapters (excludes the third generation adapters). Hardware RAID cards support multiple virtual drives. For example, you may have a RAID 1 volume for the operating system, and a RAID 6 volume for your data. These will likely be identified as virtual drives VD0 and VD1. In a similar way that the main motherboard BIOS can be set to boot from different devices - including the RAID controller - the RAID controller itself can be set to boot from different virtual drives. If you have moved or recovered a virtual drive, you may need to configure the controller to boot from the correct drive. An indication that this is require is if the RAID card is seemingly ignored in the boot order, or if you get a BIOS message about an invalid boot device, or an invalid boot loader. The instructions vary depending on whether or not you have a 3G or 6G controller, or one of the new 12G controllers. Boot the system into the RAID BIOS by Pressing CTRL + G when prompted. After the system has detected the drives, the RAID BIOS will start. You will be prompted to confirm which controller you want to access. Press Enter or click on Start. Note the IDs and sizes of the virtual drives - for example, ID: 0 - 278GB, ID: 1 - 2.725TB. Usually an operating system is installed on the smaller RAID 1 volume. 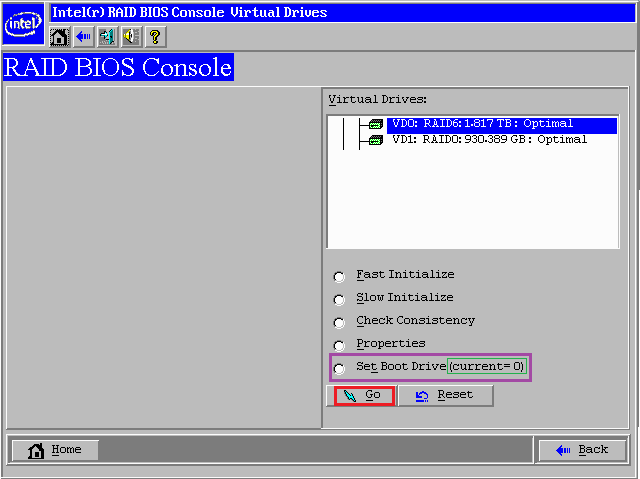 Click on Virtual Drives on the left hand side. You will now be presented with a list of virtual drives and can now set the boot drive. Highlight the VD you want to boot from. On most systems, this is the smaller drive used for the operating system. Then select Set Boot Drive, then click on Go. You will be returned to the same screen. Note that the system has accepted the change in boot VD. Click Home to exit making changes to Virtual Drives. In the main view, click on Exit. Select Yes to exit the RAID BIOS. Reboot the system using CTRL+ALT+Delete or the reset button when prompted. Boot the system into the RAID BIOS by Pressing CTRL + A when prompted. After the system has detected the drives, the RAID BIOS will start. Press CTRL+N twice to go to the Ctrl Mgmt tab. Use the TAB key to highlight Boot Device. Press Enter to get the list of VDs available for booting. Now use the TAB key again to go through all of the options on the page, until APPLY is highlighted. Press Enter on APPLY. Once the setting has been applied, the screen will simply highlight the first option on the page again. There is no other confirmation that the settting has been saved. You can now safely exit the RAID BIOS by pressing ESC and then pressing Enter whilst OK is highlighted. Then reboot by using CTRL + ALT + Delete when prompted. 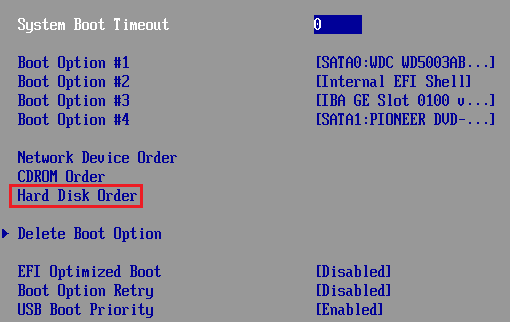 Tip: When you have made any RAID BIOS changes, if your system still does not boot the operating system please re-check the made system BIOS device boot order. 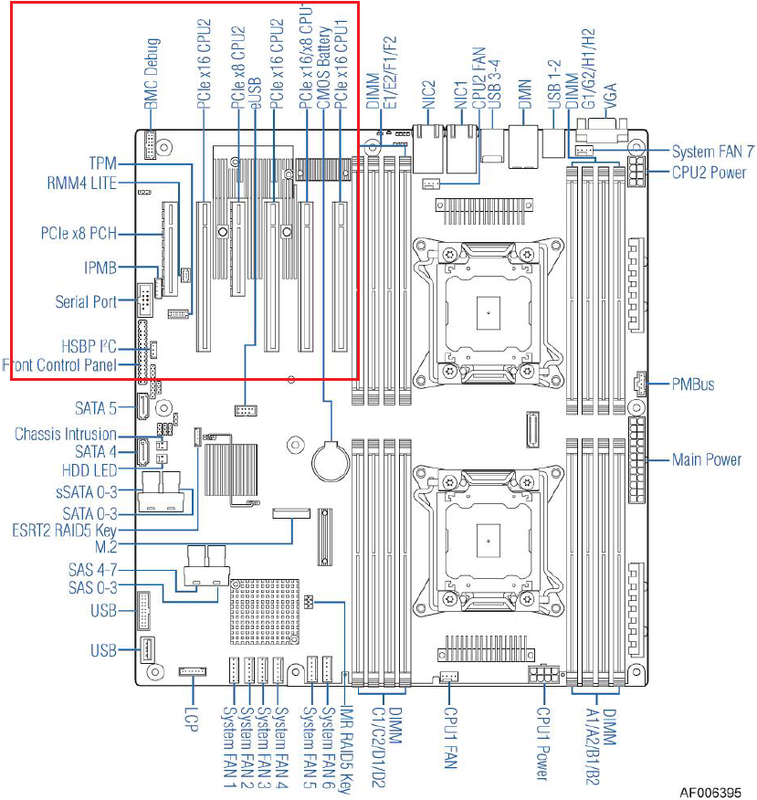 Why Are Some PCI Express Slots in my Intel Server or Workstation not Available? Some Xeon E5 workstation or server based systems may not have all PCI Express Slots available for use. When you plug a card into a Slot that is not available, the card is not detected at all in the BIOS or in Windows. In a modern workstation or server system, the PCI Express Slots are almost without exception connected to the PCI Express Lanes on the system processors. This enables fast transfers and low latencies. Most Xeon E5-2400 or Xeon E5-2600 systems support up to two CPU sockets. Many (but not all) of these systems split the PCI Express slots in the system between the two processors. This means that if you have a dual CPU socket system, but only one processor is fitted, then some PCI Express Slots may be unavailable. Refer to the motherboards technical product specification (TPS) to see which slots are connection to which processor. Generally speaking, the PCI Express slots nearest to the system memory are available, as they run from Processor 1 on most motherboards. The PCI Express slot furthest away from the system memory may also be available, however this will be a PCH Slot and may suffer from increased latency. Use the Intel Support Page to find TPS documents for Intel Server boards or see the attached article for some commonly used board TPS documents. Fit add-in cards only to slots which are available. Tip: On most Intel Server boards, slots are numbered starting at 1, furthest from the system memory. This means that the PCH slot is usually Slot Number 1, although this varies from model to model. The first diagram shows the Slot availability as part of the chipset and processor layout; the second diagram shows the availability by physical slot. The first diagram shows the Slot availability as part of the chipset and processor layout; the second diagram shows the availability by physical riser slot. The three riser diagrams from the System's Technical Product Specification show the PCI Express availability at each slot, and which processor provides the connectivity. PCI Express Slots connected to the PCH are usually x4 or x8 PCI Express slots connected to the motherboard chipset. Because they don't have a direct connection to the processor, the performance of these slots is often slightly lower. However they will always be available for use in whichever processor configuration. MUX Slots are PCI Express Slots that share some or all of the PCI Express lanes with other slots or devices. For example, a PCI Express x8 MUX based slot might have four lanes coming directly from the processor, and four more lanes that go via a MUX. The MUX shares the PCI Express Lanes between that slot and another slot. MUX based slots usually do not have any compatibility issues but bear in mind that the bandwidth on MUXPCI Express lanes is shared. PCI-DMI Slots are PCI Express Lanes running from a CPU. However, these lanes are normally used for CPU to Chipset communications. When implemented as PCI Express Lanes, the result is often a PCI Express slot that is slower or smaller, for example Gen.2 and x4. Some PCI Express Slots may not be fully wired. For example, a PCI Express x16 connector may, on some systems, only be x8 electrically wired. This means that half of the PCI Express lanes are unavailable. Plugging in a PCI Express x16 device may work if the device supports running with only half of the lanes connected, but it will run at reduced bandwidth. There are different generations of PCI Express available. PCI Express Generation 3 (or Gen.3) supports 8 Giga-tranfers per second, resulting in a little less than 1GByte a second of transfer performance per lane. If you have a PCI Express Generation 3 device, always use PCI Express Generation 3 slots in preference to PCI Generation 2 slots wherever possible. Stone Xeon E5 based server system families, including S2400 and S2600 servers.